thursday morning honestly arrived a little too early for my liking. although brian’s bed is extremely comfortable, a few more hours of shuteye really would have done wonders. well, there’s no room for whiners on this vacation, so we were up and at it by 7:30 a.m. an early day indeed! brian was going to take the later bus to work so that we’d have a little morning time together. 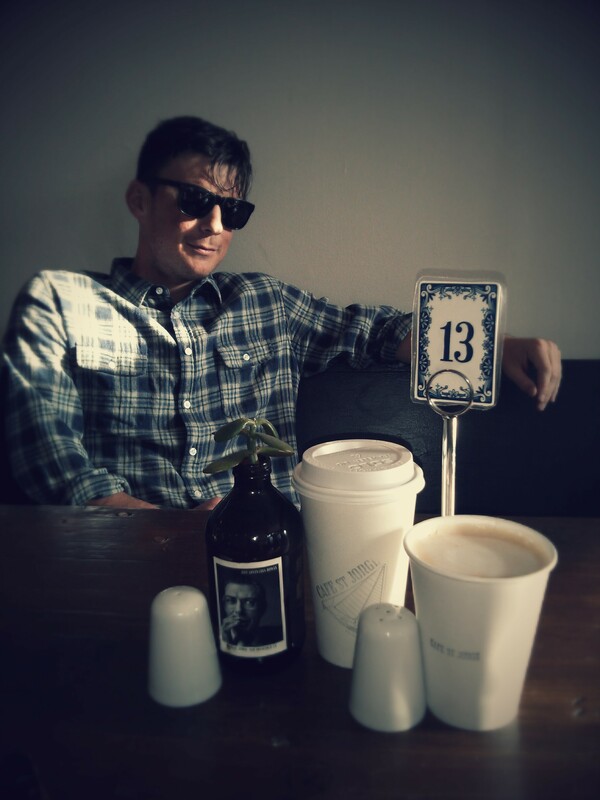 our first destination of the day was cafe st. jorge for a little caffeine and munchies. this place was all kinds of adorable, and i’m sure i embarrassed brian with all my question asking and picture taking. hey, there comes a time when one must be a shameless blogger, and that time for me is now. this type of coffee shop is right up my alley, and if i lived here, i bet it’s where i would go to write and read. brian went for a large black coffee and i had a small cafe au lait. it was a solid au lait, a good thing since it is my favorite coffee beverage. my cousin is such a stud! for eats i had the banana bread. i didn’t want anything too filling since i was planning to eat practically all day long. 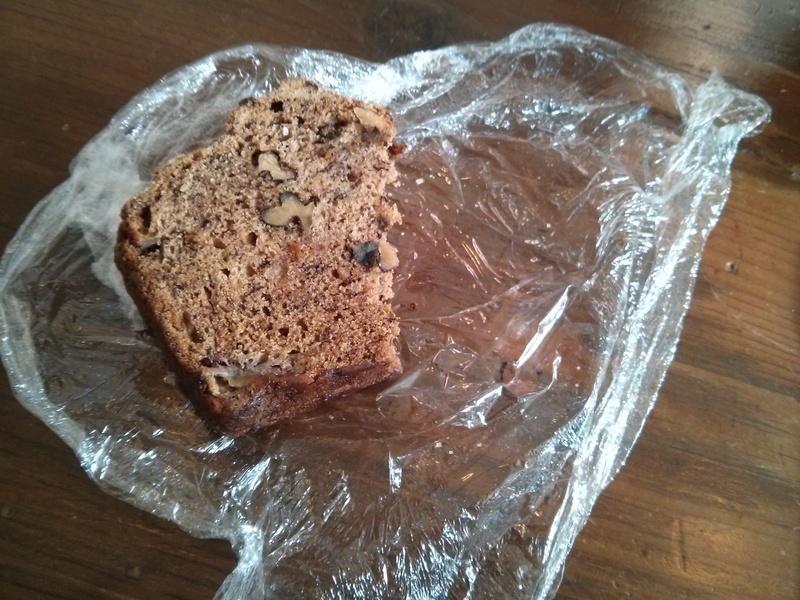 i wish it had been a little more moist, but the flavors and density you come to expect from banana bread were definitely there. brian went with his usual in the small granola bowl. it was the cutest and most homey bowl i’d ever seen in my life, and i’m lucky he let me have a couple bites. 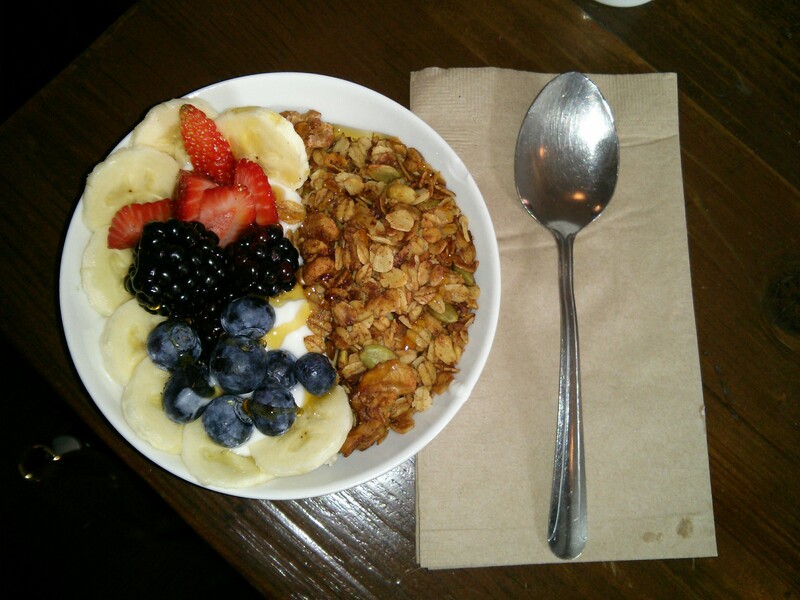 the yogurt wasn’t overly sweet, and the homemade granola was stupid good. the fruit was fresh, and everything together in a single spoonful made for a very tasty breakfast. we grabbed lids for our coffees and began our morning hike. brian had warned me about the hills, but, yeah, i quickly felt out of shape, and i run half-marathons for goodness’ sakes! slowly my layers were stripped as we continued upward towards the heavens. all that was running through my head was miley cyrus’ hit “the climb.” remember folks, it’s about the journey, not the destination. brian promised me the effort would be worthwhile, and after we were atop the city, i realized he was absolutely right. the view from this high up is just gorgeous, a sweeping scene of san francisco and all its neighborhoods. the breeze was cooling, and the ultimate feeling of relaxation set in as we took in everything. ah, thank goodness for vacation days! our selfish escape had to come to an end so that brian could get to the office. we carefully and slowly descended the gravel paths and made our way back to the apartment but not without brian taking me by some intentionally installed slides. good grief, what a fun city! we made a quick stop at casa de dolo to grab some things, and then brian headed to the bus stop while i went the opposite way. brian went to give me his apartment key in case i needed to come back for whatever reason throughout the day, but i told him to hang on to them. not having access to his place would force me to get creative in my exploration, and it was a style brian appreciated. i headed east, taking plenty of time to let my legs carry me up those brutal inclines. on the way i grabbed some pretty pictures of the greenery here. i like how much vegetation there is in this city, happily reminds me of home. oh, and then i had to stop and take some selfies. if you didn’t think i was a goofball before, i’m sure you do now. 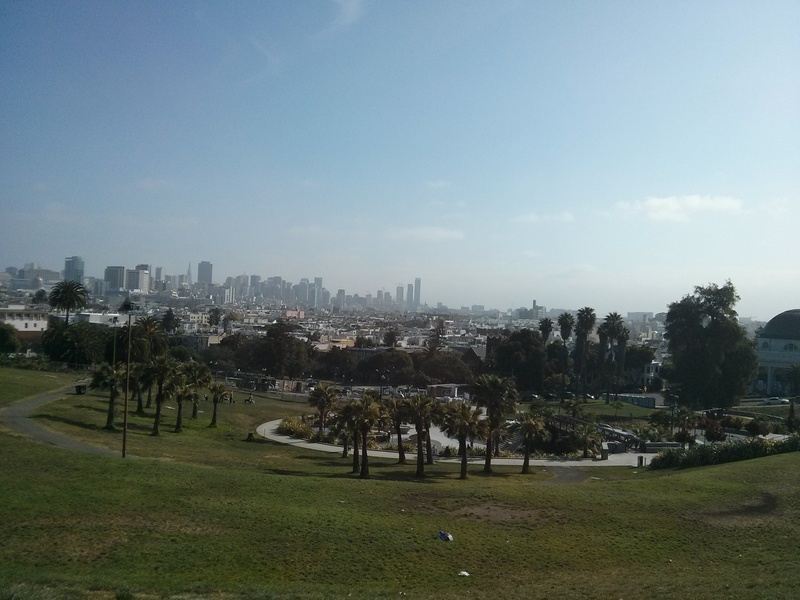 i arrived at the corner of 20th and dolores and couldn’t help smiling once mission dolores park came into view. this charming green space is clearly a cherished treasured by the locals. i say so because i wonder where else in the city you could have a great view of downtown, play with your dog, relax on a bench, and take a hula hoop lesson all in one place. i grabbed some bench and soaked up the sun. its warmth was welcome considering the cool spring winds were gently wrapping around me. i enjoyed the peace and quiet while absorbing some vitamin d. nothing revitalizes you quite like a little natural sunshine. i read a couple chapters in my book, chatted with phillip on his lunch break, and then was on to my next destination. can’t keep me in one place for too long! my feet lead me southeasterly to a coffee shop recommended by my college buddy chris. 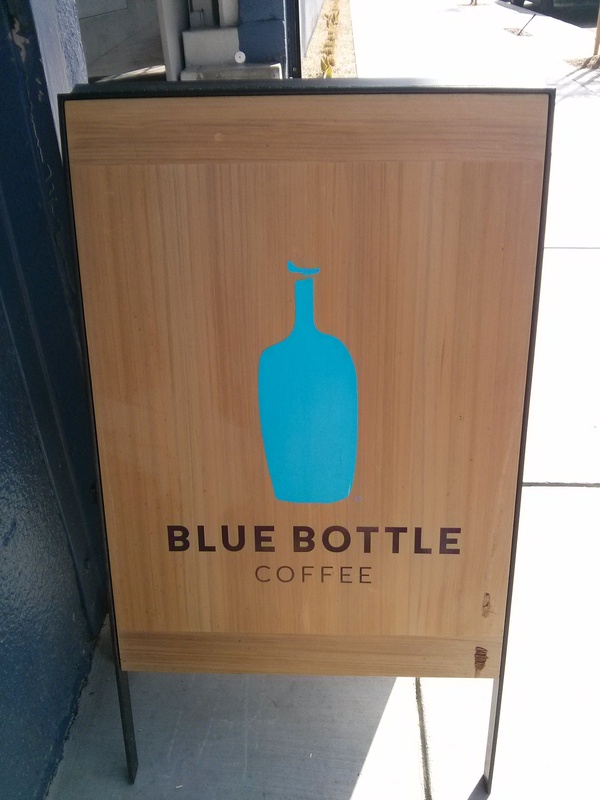 it was blue bottle on 18th and harrison, and it actually shares a kiosk space with heath ceramics. i hopped in line with the other customers. in an effort to find my favorite coffee place in san francisco, i ordered a cafe au lait here as well so that i could have an apples-to-apples comparison. smart thinkin’, kels! 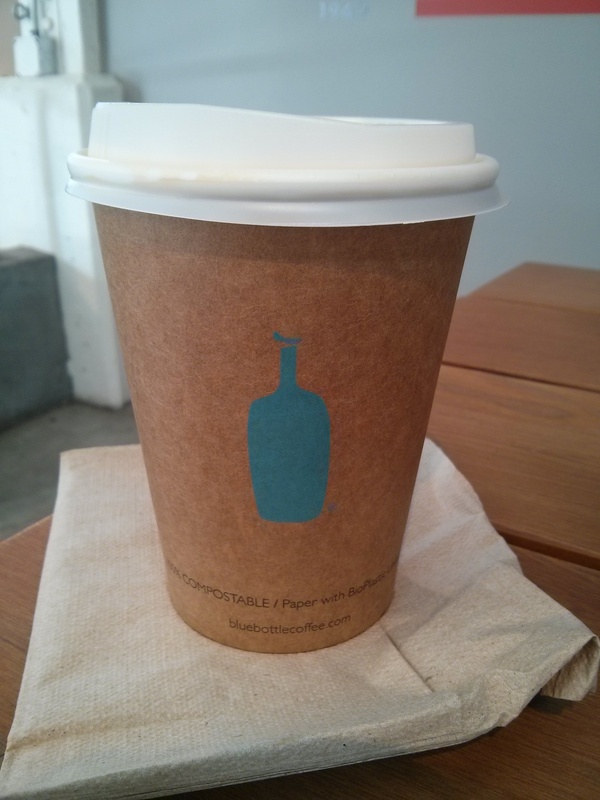 here at blue bottle, they use the pour-over drip method to produce a complex yet delicate coffee flavor. i arrived at a good time, for the line was quite long by the time my cup was ready. 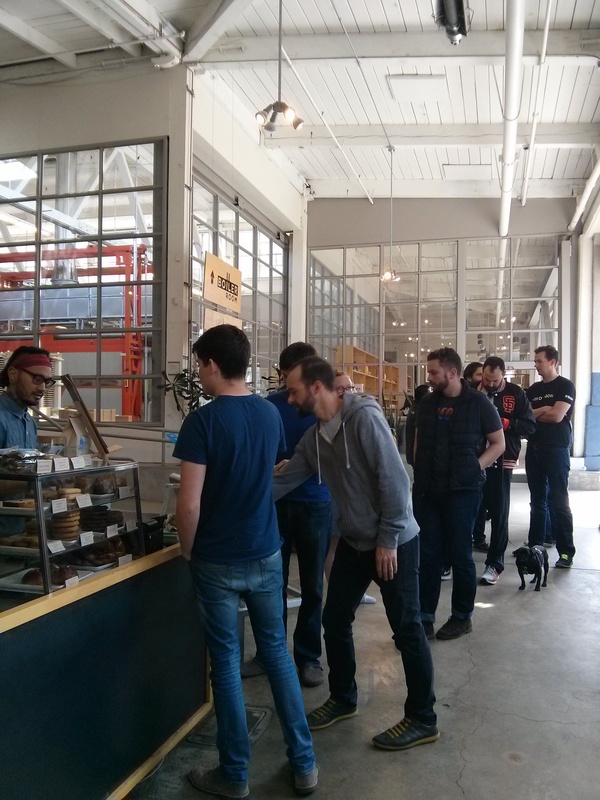 look at all those thirsty san franciscans! i found some space at one of the large picnic-like tables for me and all my stuff. it was barely past eleven, and with the whole day in front of me, i knew there was no hurry. i whipped out my notebook and tablet so that i could go ahead and chronicle the happenings of the morning so far. the barista had crafted some beautiful frothy art on top of my au lait, but because it was so full and they were so busy, i wasn’t able to get a pretty picture. oh well, here’s a shot of the cup for ya! the au lait was nice and hot and not bitter at all, which i was worried it might be. i finished it off, but i’m inclined to say i enjoyed my au lait from cafe st. jorge a touch more. perhaps it’s because it was my first one in a while, i don’t know. 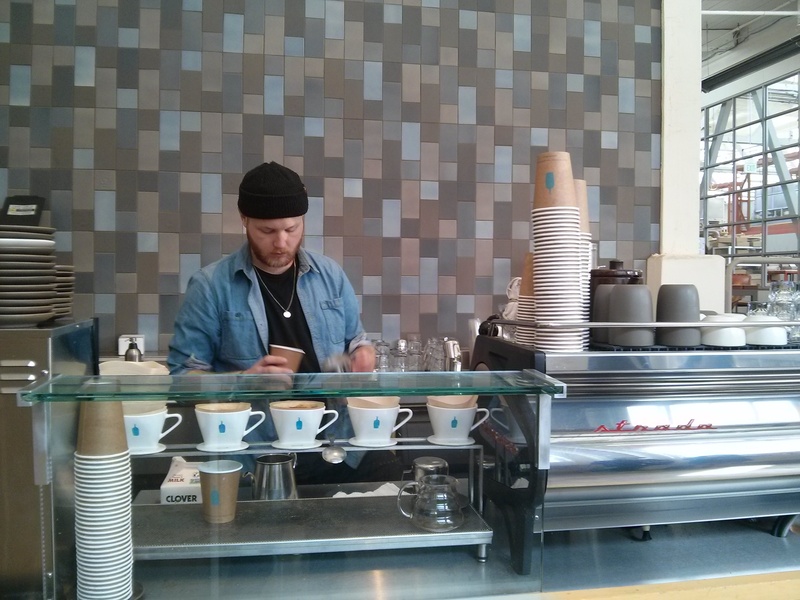 regardless, i always appreciate a well-made cup of coffee, and that is what i certainly got. 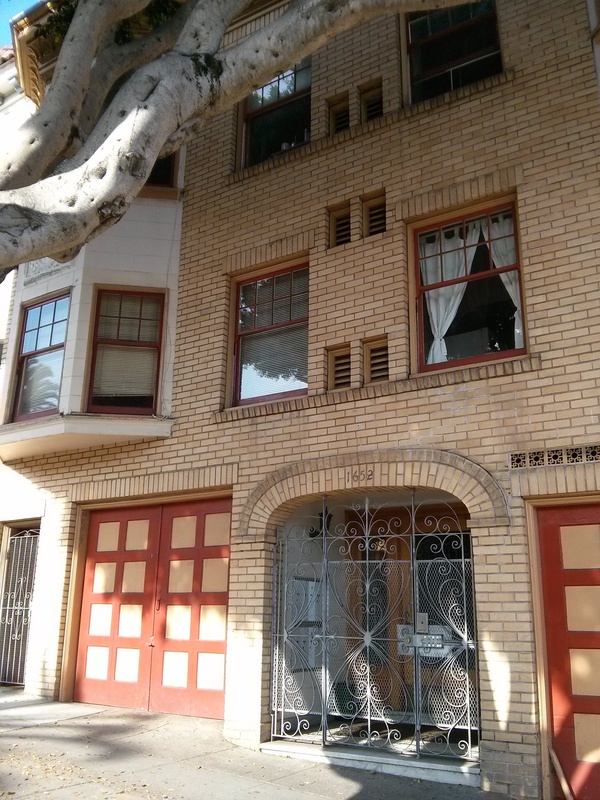 i next wanted to actually get into the city, and even though i’ve got some strong quads, it would have been a tiring trek all the way from the mission district. so, public transportation it would be! 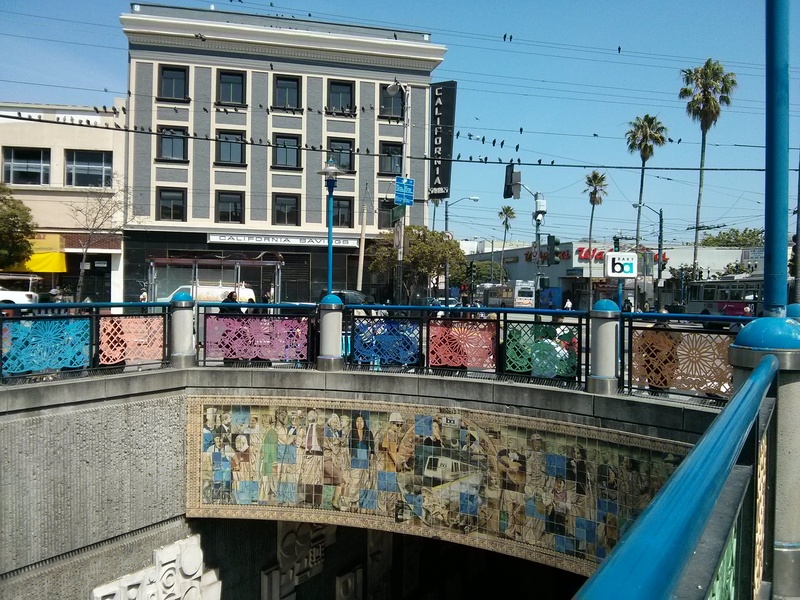 over to 16th and mission i marched to the nearest bart stop. the good thing about the metro here is that it’s nice and straightforward like marta in atlanta, which means i was able to get myself to embarcadero without much trouble at all. i got my bearings once i was back above ground, and with more friends’ suggestions, i found my way to wexler’s for a light lunch. this little place my good friend brian recommended was packed with the local lunch crowd, but to my luck, they had a single seat at the bar available. it’s like they knew i was coming! i bumped my way to my stool and was kindly greeted by josh the bartender with a glass of water. since i’m not on the clock the tiniest bit today, an afternoon drink was a no-brainer. 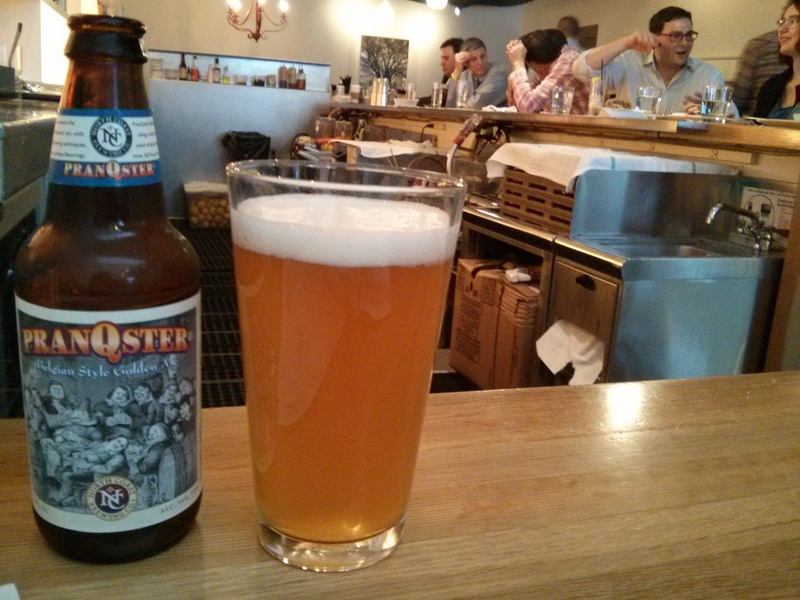 i requested the north coast brewery’s “pranqster” golden ale from fort bragg, ca. 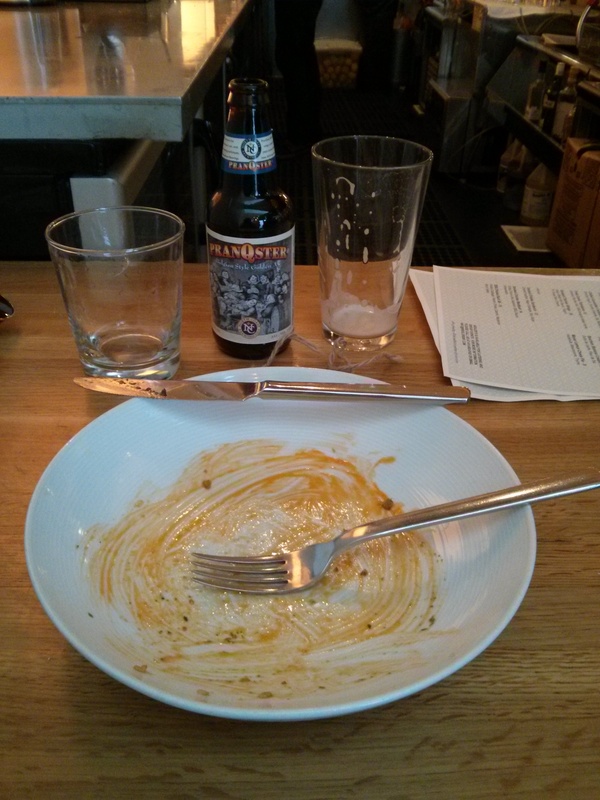 oh man, it was so good. you gotta support and love the local breweries, especially with something that has a “floral nose, full fruity flavor, and clean finish.” if i had a trained beer palette, i’m sure those are all the things i would say, and in my expert drinking opinion, it’s an excellent beer that i would readily recommend to a friend and happily order again myself. i’ll say, though, one beer was plenty for the afternoon, because at 7.6%, i was feeling pretty great after just the one. 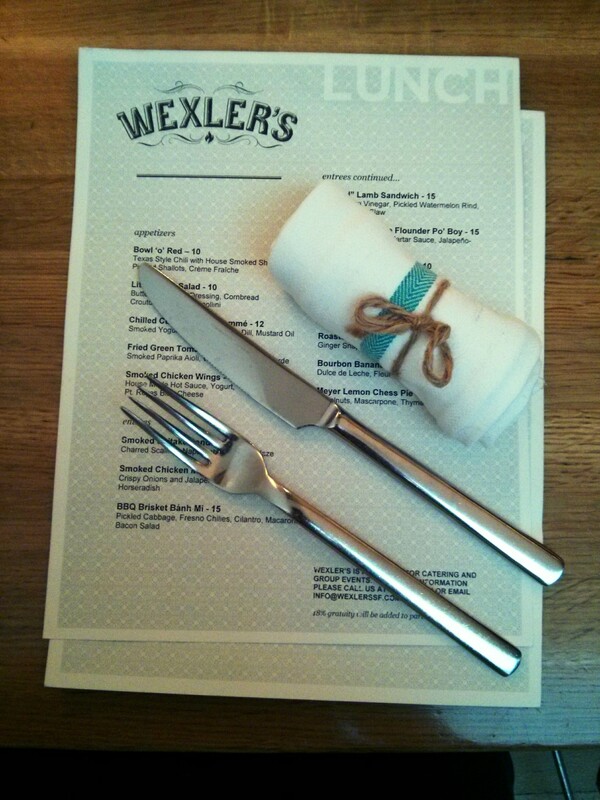 since i was conducting my own food tour of san fran, i didn’t want to fill up too much at wexler’s. however, i hadn’t eaten a thing since finishing off my banana bread at blue bottle, so i was ready to do a little eating. torn between the flounder po’ boy and fried green tomatoes, i was advised to go with the appetizer so that i’d have room in a couple of hours for something more. easy enough decision! these fried green tomatoes are served with a smoked paprika aioli and wild arugula salsa verde, a very intriguing dish for a girl from the south. first things first, hats off to the chef for the presentation: simple yet very tempting. the bright orange aioli is quite beautiful against the stark white bowl and alongside the tomato and rich green salsa. the initial bite was piping hot, and although i burned my tongue a little, i didn’t mind at all. the tomatoes were crunchy and juicy and almost kind of sweet. the crisp breading wasn’t too heavy, a plus to show off the thoughtfulness and quality of the dish. with the tomatoes in season, the whole plate is nearly flawless. the aioli and salsa are delicate garnishments that enhance the flavor of each ingredient. i usually take my time while eating, but i ate all four of them up right away. this small establishment has a mighty culinary eye, and i would gladly return here on my next visit to have these tomatoes again and to try something else. since i had plenty of the afternoon for more venturing, i let myself leisurely find the east bay. brian insisted i check it out for the beautiful views, and he definitely didn’t steer me wrong. walking along the waterfront i was able to view the bay bridge, the ferry building, oodles of piers, and fisherman’s wharf. i had majorly wanted to do a tour of alcatraz, but the tickets were all sold out! note to self, make reservations way in advance next time. although i didn’t get to cruise around it or walk on it myself, i was able to see it from a distance. i might not be a history buff at all, but i’d be quite interested to learn more about it. after practically inhaling a deliciously salty and doughy pretzel, i stopped to take a quick break on the maritime bleachers. i hadn’t worn a pedometer yesterday, but i can guess i’d walked something around four miles already, if not more. i’m just glad i put on actual athletic sneakers instead of my flats. my feet never would have forgiven me if i’d done that! i still had a few hours before dinner with brian, so i dragged myself up through fort mason to see exactly were the golden gate bridge was. well, wouldn’t you know it: it still looked a thousand miles away. gosh, dang it! i so badly wanted to begin a journey over there, but i didn’t i could handle it. my extremely heavy shoulder bag wasn’t helping the cause either, so i promised myself i’d go the next day. i mean, ubers and buses can help me get there just as easily, right? right! with that decision made, i turned south on columbus to head back into the city. 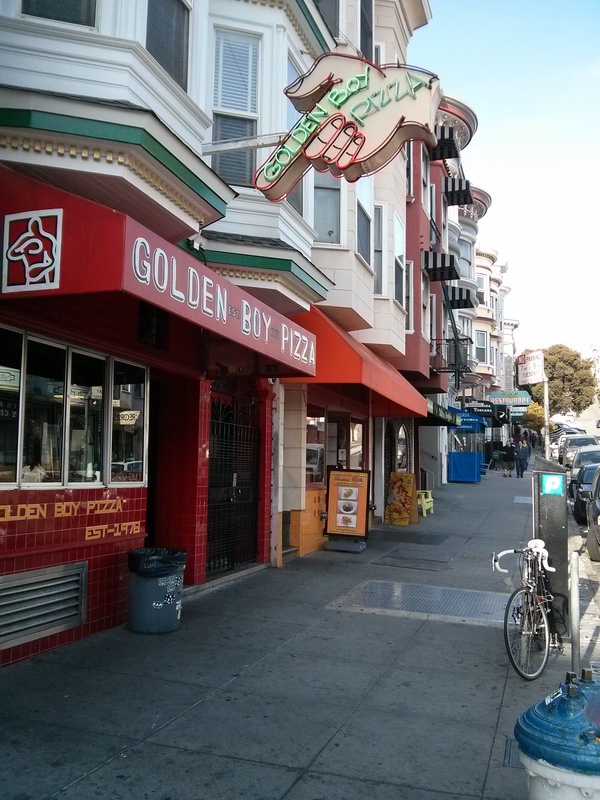 next up on the eating tour was a place called golden boy pizza, a suggestion from my well-traveled friend garth. he’s been all over the states, and the world for that matter, and i wanted to try and fit a slice in before the trip was done. after a couple wrong turns, i was happy to find their large sign pointing me right into their front entrance. ah, a little rest for the weary tourist! i wasn’t too ravenous, but i knew it’d be a little while before brian and i would get seated for dinner, so a single slice was all i needed. they’ve got a simple menu here at golden boy, and even though a classic cheese piece probably would have done just fine, the sausage pizza was kind of staring me down from its pan. “a single slice of sausage, please!” was my appropriate response, so they heated it up for me as i found a spot at the bar. the employees here at golden boy are incredibly friendly, good people just making some good food. 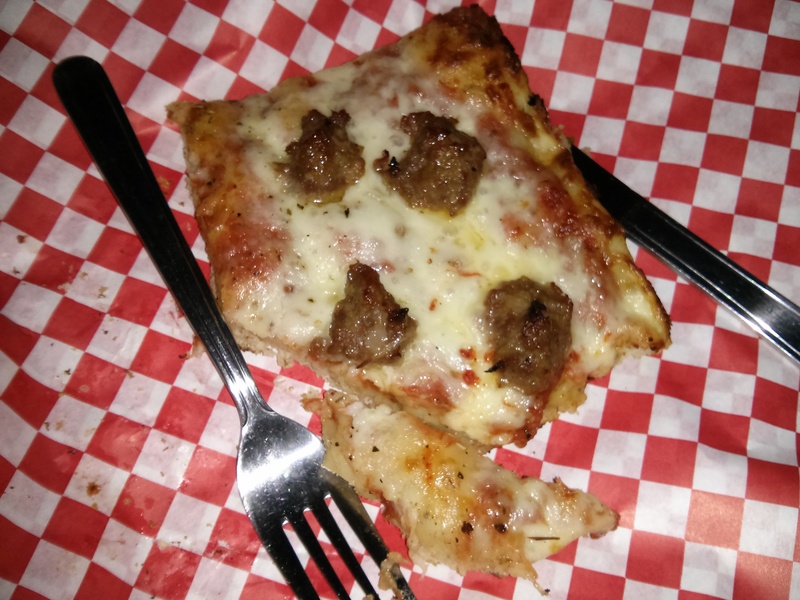 although thin slice new york style ‘za is my favorite, i was loving this thicker crust sausage. the sausage was a teensy bit spicy but balanced out by the creamy cheese. the crust was crispy and the dough was not too heavy. for only three bucks, i can see why garth was quick to recommend this local pizza joint. thanks, bud! i didn’t want to crowd the restaurant (it’s super small but quite clean), so i walked back north a couple blocks to enjoy the sights and sounds of washington square. this little park is nestled in among restaurants and businesses and made for great people watching while i had some time. although i was catching up with phillip on the phone about our days, i was greatly distracted by all the pups. there were, seriously, about 20 dogs just roaming around and playing, all of different sizes. one guy was playing frisbee fetch with his energetic mutt. the pup was adorable because he had this cute red bandana hanging loosely around his neck; i swear his name is probably banjo or something like that. with so much to look at, i really didn’t get much reading done. no big deal, though. there’s a five-hour flight home on sunday with my name on it that will give me plenty of time to do just that. at about seven o’clock, i grabbed my things and got to my feet again to meet brian for dinner. we were going to the famous tadich grill off california in the financial district. this seafood restaurant has been around since the 1800s, and considering it is still in great business today, you know it is a classic san franciscan establishment loved and adored by locals and visitors alike. i’d been once a few years ago when i was in oakland on work, making a special trip into the city just to come dine here. it is one of my father’s favorite restaurants, and i told brian we just had to go one night for dinner. we patiently waited our turns to be seated at a table for two. they do have a dining bar that’s first come first serve, so if it’s packed, you can be that person that hovers, waiting for people to finish their drinks and meals. brian and i had both had long and tiring days, so we were able to pretty quickly decide on what we wanted to eat. brian had the swordfish while i went for a bowl of clam chowder. both dishes hit the spot perfectly for each of us, and if i lived here, you can bet i’d be a regular. we ordered some desserts to go, paid the check, and sleepily walked to the closest bart station. we were both so exhausted that i’m surprised we didn’t fall asleep on the train. we finally made it back to the apartment and chomped down on our carrot cake and cheesecake. it was the perfect end to a wonderful day. friday had a lot to live up to, but i’m going to say now that i bet it will also deliver. good night, san fran!